Caring for nails Naturally To Look Beautiful. Nails are contained body parts of animals or growing on fingertips. Nails grow from a soft gel-like cells that die, harden, and then formed when starting to grow from his fingertips. At the base of the nail cuticle serves to protect from dirt. The main function is to protect the finger nails are soft and full of nerves, and heightens the touch. Nails are not part of the bone protein. On the skin under the nail there are many capillaries that have strong blood supply, causing a reddish color. Such as bone and teeth, nails is the hardest part of the body because the water content is very slight. Growth fingernails in one week on average from 0.5 to 1.5 mm, four times faster than the growth of toenails. Nail growth is also affected by body heat. Nail care can also be done in a natural way without the need to spend a lot of money. Because the required materials are also widely available around you. Blimbing Wuluh. Useful for cleaning dirt on the sidelines of the nails and outer skin as well as strengthen the nails. The trick sukup by rubbing pieces of blimbing wuluh on nails will be cleaned, after rinse with clean water. Drink plenty of water. One easy way to beautify and strengthen nails from the inside is to multiply the drinking water. Consumption of water helps to keep nails are not dry. Drinking milk and consumption of foods containing calcium. benefits to strengthen the nails. Like food made from milk and cheese, Stingrays and sardines, nuts and seeds, vegetables like broccoli, kale, spinach, etc., fruits such as red apples, strawberries, papaya, pineapple, mango, avocado, grapes, mangosteen etc. Aloe vera. Aloe vera has many benefits. In addition to hair care, was also able to take care of the nails. The trick, wash aloe vera and apply evenly on the nail. Perform this treatment regularly, the nails will look more beautiful and clear. Papaya sap. Nice to clean the outside of the skin that are not easily broken nails and peeling. Lemon (lime). To restore the nails are yellow. How, to prepare lemon juice, and mix one tablespoon of lemon juice to toothpaste (recommended toothpaste to whiten teeth). Stir well, then apply to the nail. Wait for it to dry. After the nail flush with warm water. Do it regularly at least once a week, then we will get a normal nail color. Garlic. Contain substances that are very useful to strengthen nails. How, grated garlic until smooth, then apply to the nail. Wait a few minutes, then clean nails. Can also directly rubbing garlic on your nails. 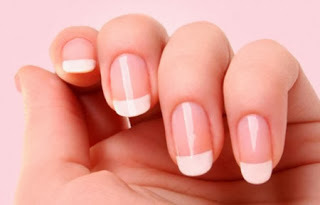 Do it regularly, then your nails will be strong and not brittle. A mixture of honey, eggs and olive oil. The benefit is to moisturize and soften the nail. We who had nails dry and lacking nutrients, use this tip. The trick, mix two tablespoons of honey and olive oil in a pan. Heat and stir until well blended, then prepare an egg whisk. Mix honey and olive oil dough with beaten egg, evenly apply on your nails and wait 10-15 minutes, then wipe your nails.